I found this on Pinterest today and had to share. So true. I can't even begin to guess how many tubes of chapstick I have lost over the years and I am always so excited when I use one up and get to throw it away myself. I had quite a few questions yesterday about keeping your feet dry while running in snow. Sometimes I use bread bags over my feet. I have tried grocery sacks but they always seem to rip or tear and my feet get wet anyway. I did get in contact with a certain sock company yesterday and they are sending me some socks to try out that are supposed to help keep your feet dry! 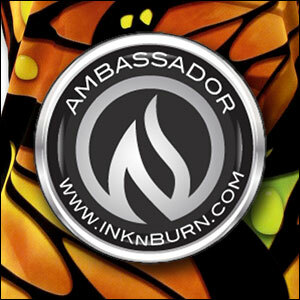 So excited about this, so be on the lookout for a sock review and possible giveaway to help keep your feet dry too! Anyone have any great keep your feet dry tips? How often do you get to the end of a tube of chapstick? Do you feel a certain sense of accomplishment when you do? that is such a good question about the dry feet. i have not tried anything specific in the past. i ALWAYS lose chapstick. i probably have at least 10 in my house right now and pretty sure i only know where one of them is. ha ha so funny!! I go through so much chapstick it is rediculous. I have incredibly dry skin. I have had psorisis since I was little and it is a daily battle. The winter is always the worst for me. TOTALLY on the chapstick thing. Reminds me of my Gospel of Sunglasses: "The amount of time you own a pair of sunglasses (i.e. don't lose them) is inversely proportional to the amount of money you paid for them." Dollar Store sunglasses are forever. A "nice-ish" pair? Gone in a week. I've heard of people putting duct tape over the vents in your shoes but I guess I've never tried. Curious to hear what you have come up with. And I've finished off several tubes of chapstick. But maybe because I go through it so fast I don't have time to lose it. ya know what might work for you and your feet for snow running... a pair of thing (like 2 or 3 mm) neoprene socks... your feet will sweat a bit, but they wont get "cold" and they wont feel "wet" thats the goal right? When I get to the end of a tube of lipstuff I dig out the last bits to use it all! So, bags over your feet? Indside your sneakers? Do they make your feet sweat more? Good luck with the new waterproof socks. Will be interested to read how you like them. How fricken true is that?! I just was telling someone how I lose all my chapsticks. I have to buy a new tube every winter. Never ever finished a tube ever before. I am working on two tubes now though, but I've already lost one. Never finished a thing of floss either in my life. How do I keep my feet dry? Hmmm ... I avoid stomping them into puddles when I run. Would love to read about those major powerful socks! I"m super curious about these socks you're trying--please let me know if they work! I have gaitors that I wear snowshoeing and cross country skiing and I sometimes wear those if I'm running in deep snow, but they still do nothing for the water actually melting through the mesh of my shoes! 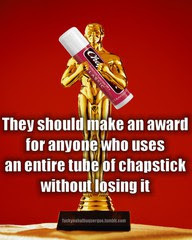 My chapstick addicted husband would never win one. I'm 99% sure I have never finished a tube. I always lose it before! My tip for keeping your feet dry is to run on the treadmill...so I am no help! hahaha, I ALWAYS lose it before it's even half way used! Ha! I ran in the cold today and my nose was numb! I saw that on Pinterest too and laughed! I've miraculously had the same tube of Chapstick for over a year now....gotta be a record! I have a terrible habit of chewing on my lips and they crack really bad year round, so I am constantly applying chapstick and have it everywhere in my house! Always on hand! I am actually sad when I have to throw away a Chapstick. Haha. Ido lose them sometimes but I usu find them (in a pocket usually) so I do get to finish them off most of the time. Hilarious! I'm always losing my chapstick, but now I keep a tube scattered throughout my apt. It really helps. I do love it when I find one in a long-forgotten pocket or purse, though. Makes me gleeful. What a dork. hehe. I've not yet really experienced wet feet when running. I tend to avoid snow and stick to the well-cleared paths.